Doux Reviews: Sunday discussion: Who won the week? Sunday discussion: Who won the week? So many premieres. And it isn't even October yet. This week's discussion question: what was the best premiere you saw this week? Okay, we can include last week. Okay, the month of September -- so far, but that's it. Plus, what was the worst? My vote is for Best Time Ever which I thought was appallingly bad and not worth Neil Patrick Harris's time. As a visual aid, here's an alphabetical list of nearly all of the shows that have recently premiered. I'll go first! 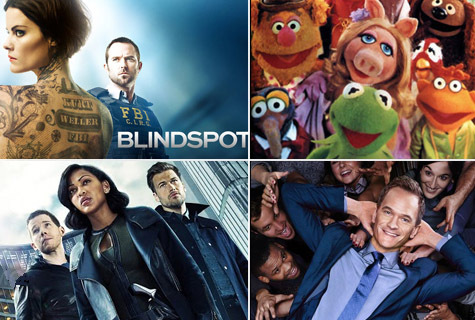 For premieres, I really liked Blindspot and Limitless. The Muppets made me laugh, but I'm worried that the magic is gone. I'm very much enjoying the fourth and final season of Continuum. The Scandal premiere made me wonder -- are they really, finally, going there? And unfortunately, Best Time Ever was awful. I can't quite put my finger on why, but it felt like they were trying too hard. And that thing with the couple in the beginning came across as outright creepy. Or was that just me? I'm going to sound repetitive, but Blindspot and Limitless were my favorites of the week. The Muppets was wonderful, and I hope it keeps it going, I want to love this new version. Fear the Walking Dead is starting to take off for me, and I'm really looking forward to tonight's episode. Gotham started pretty strongly, and Continuum continues to impress. What I find interesting is the number of shows on that list I didn't even bother watching. Unfortunately I think the bottom of the heap goes to Best Time Ever with Neil Patrick Harris, what was wrong with that show? Black-ish won the week for me. The season premiere was about the "n-word" and how it gets used (to various effects). It was hilarious and rather heartwarming. The Loser of the Week was, for me, Heroes Reborn. I checked it out mostly to be polite (what do I mean? I don't know...) but couldn't watch more than 20 minutes of it. Alas. I really liked The Muppets. I keep telling people it's 30 Rock with Kermit as Liz Lemon and Miss Piggy as Jenna Maroney. I'm going to Say Doctor Who, because it was the only thing I actually watched last week. But even if it hadn't been it would still win. It had the Doctor playing electric guitar on a tank in the middle ages, all so he could make a dad joke. How does that not win? I watched Blindspot, Minority Report and Limitless. I liked them all. But I was so pleased to see Jennifer Carpenter on Limitless. I would watch it just for her. Still need to catch up, but damn-lady Sif has a show and Deb from Dexter too. I need to see those. I'm enjoying Daredevil about five years after everyone else. Not much of interest to me has premiered yet this fall, so I've only seen four shows on that list. Of those four, the one that's "winning" with me at the moment is Continuum, although it took me a few episodes to get back into the groove with that series. We did watch the premiere of The Muppets, and it made the husband and I laugh heartily several times, but I'm not sure how I feel about it overall yet. Some parts of it were really off-putting. We'll be giving it a few more at least. We're also enjoying the new season of Drunk History on Comedy Central. Not every episode is a winner, but it is always a great deal of fun to see who they've got doing the lip sync acting in each segment (Jason Ritter! Josh Hartnett! Jason Momoa! Octavia Spencer! Maestro Harrell and Andre Royo! ), and sometimes we learn really interesting bits of history. I'm quietly watching every episode of the new season of Longmire as I have quietly watched every episode that has come before.